Protective Mothers Alliance International (PMA) has launched “Unstoppable Mothers”, a powerful photo and essay project to give voice to Protective Mothers and their Children. The photos depict the loss and grief a Protective Mother experiences when she is forcibly separated from her child(ren) due to family court injustice, or the events she missed in the life of her child. 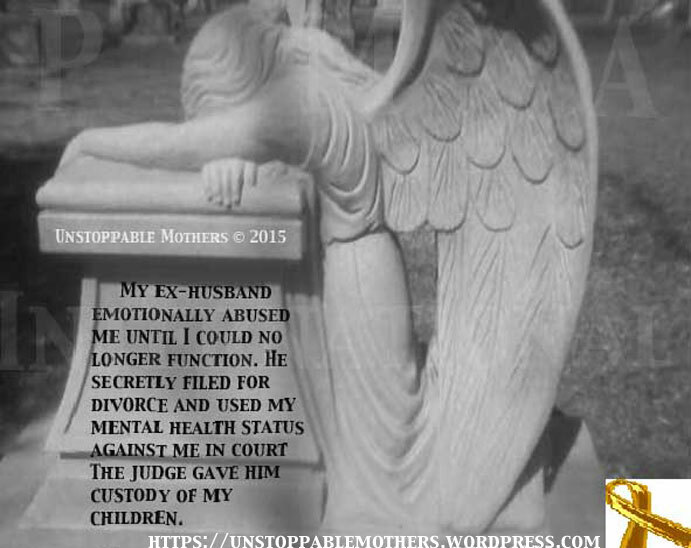 The essays, in Protective Moms’ own words, are common real life family court situations. Protective Mothers reveal the most outrageous action a judge took in their case. OR, the Protective Mom shares what she has missed most about not being in her child’s life.